Lytestream Electrical, along with Interactive Projects and Design are delighted to have sponsored the Darlington 21st Allstars JFC 2017 tournament. The tournament took place between the 3rd and 4th June 2017 which saw over 120 teams (1200 youngsters) enjoying the game. The tournament overall was a great success. 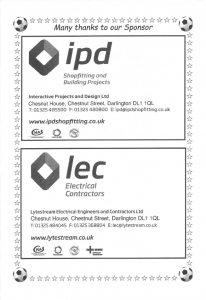 Lytestream Electrical and Interactive Projects and Design have been sponsoring the football club for a number of years now and hope to continue sponsoring the Allstars for future tournaments to come.